Traditional bow hunting is an exciting sport, and with a little dedication and discipline, anyone can learn to hunt like a professional in thirty days. On days 1-10, repeat as often as you can, taking five or six arrows and focus on form as you shoot blank bale on a chest level target from about ten or fifteen feet away. Draw your bow and let the pin in your sights float and then settle. Pull the bow steadily, applying pressure. Don’t take aim! Just feel the shot, and if you can, relax and shoot with your eyes closed. On the twenty-first to thirtieth days, begin each practice by shooting blank bale, but only for the first ten minutes. Then shoot at the target for twenty minutes or more. As long as you’re able to shoot smoothly, keep shooting at the target. Anytime you feel yourself starting to aim, go back and shoot at the blank bale for a few minutes. Use a good follow through and a nice release with no stops and starts will be natural to you. Weak or tight bow arms cause most misses. 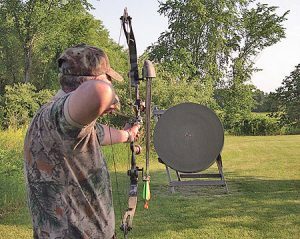 Apply steady pressure and aim right into the target with your feet lined up perpendicular to the target, and you should do well in training and hunting with traditional archery. If you are a beginner at traditional bow hunting, you should test yourself as much as you can. Repetitive practice is the only way to become as good as you can. The only real test of a traditional bow hunter is how well you shoot when you have competition or are under pressure. A good simulation is to compete with another hunter. Each hunter can shoot at a target, and keep going until someone misses. These types of competition help train traditional bow hunting enthusiasts. The only meaningful test of a bow hunter is how he shoots under pressure. Try getting a partner to compete with you. If you can get a real competition going, you will learn well. Each person should be able to shoot five arrows into a target from twenty yards away. If both of you manage to put five arrows in the target, add to the distance five yards at a time until someone missed the target. If you find you can’t handle this, you probably have never overcome your natural inclination to take aim. Just repeat the regimen until you overcome your natural impulse to aim. Traditional bow hunting is a sport you will enjoy for years to come.